To get started with Python, or more specific Django, on Cloud Foundry please read my former post: “Deploying a Django Application to Cloud Foundry“. New Relic is an Application Performance Management and Monitoring provider who deliver its products in a software as a service (SaaS) model. It allows you to get deep insights into your application. In this post I will only focus on New Relic APM, a SaaS-based Application Performance Monitoring solution, which has a wide range of agents: Java, .NET, Node.js, PHP, Python and Ruby. 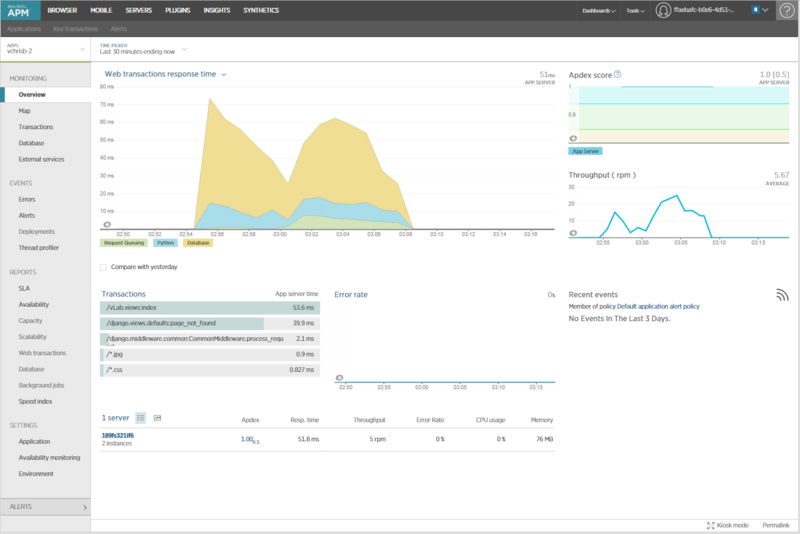 New Relic APM gives you great details about transaction times, response times and more. The cool thing is that you don’t have to modify anything in your application code to leverage these deep insights. Though we are going to use New Relic in Cloud Foundry I give a short introduction how to minimal install and configure it for a “normal” server environment. For python you just have to use the New Relic agent to start your e.g. “gunicorn” application server. After a few minutes you should see your new application popping up in the New Relic Web UI, shown above. Here you find the New Relic documentation for the python agent installation and configuration. In my former post I already described the Cloud Foundry python buildpack and the VCAP_SERVICES environment variable in greater detail. To make a long story short, the Cloud Foundry buildpack is based on the Heroku buildpack and the biggest difference is that Cloud Foundry handles all the information about bound services in a JSON formatted environment variable called VCAP_SERVICES . In contrary does Heroku add multiple simple environment variables to an app instance. So why am I talking about VCAP_SERVICES in this post at all? You need to pass the New Relic license to newrelic-admin in some way and in Cloud Foundry this license is stored in the VCAP_SERVICES variable. But using newrelic-admin generate-config to generate the newrelic.ini is not reasonable and would still require to read the license from the VCAP_SERVICES variable. Looking at the documentation for configuring the python agent on Heroku there is another way to configure the newrelic agent: environment variables. On Heroku are these variables automatically added to an app instance but on Cloud Foundry they aren’t configured! After researching, how to create the New Relic variables in an easy and flexible way, I found in the Heroku documentation “Profile.d“. All bash scripts in a folder named .profile.d are run before the Procfile is executed. To generate the New Relic variables I created three files, which are stored in the .profile.d folder. The first os_vars.sh is executed by the buildpack and exports the variables after extracting them from the VCAP_SERVICES JSON variable, using Python. The export has to be done in the bash script to make the environment variable available in the current bash session. #!/bin/sh #New Relic export NEW_RELIC_LICENSE_KEY="$(python $HOME/.profile.d/newrelic_license.py)" echo "added environment variable NEW_RELIC_LICENSE_KEY with value: $NEW_RELIC_LICENSE_KEY" export NEW_RELIC_APP_NAME="$(python $HOME/.profile.d/app_name.py)" echo "added environment variable NEW_RELIC_APP_NAME with value: $NEW_RELIC_APP_NAME" export NEW_RELIC_LOG="stdout" echo "added environment variable NEW_RELIC_LOG with value: $NEW_RELIC_LOG"
echo "added environment variable NEW_RELIC_LICENSE_KEY with value: $NEW_RELIC_LICENSE_KEY"
echo "added environment variable NEW_RELIC_APP_NAME with value: $NEW_RELIC_APP_NAME"
echo "added environment variable NEW_RELIC_LOG with value: $NEW_RELIC_LOG"
The second script, app_name.py , extracts from a not yet mentioned environment variable, VCAP_APPLICATION, the name of the Cloud Foundry application. The variable does store more information like IP address or limits. The last script, newrelic_license.py , extracts from the VCAP_SERVICES environmnet variable finally the license for New Relic. After finding a way to create the New Relic variables we need to configure our application to use New Relic. The first step is to add newrelic to the requirements.txt This instructs Cloud Foundry to install the required software. The file below is taken from my sample application on GitHub, which also includes all the other modifications for New Relic. Finally we instruct Cloud Foundry to use newrelic-admin to launch our application. A couple of minutes after pushing your appllcation to Cloud Foundy and accessing it, to generate some load, you should see some nice data in the New Relic UI! If you have a Cloud Foundry installation without a New Relic service in the marketplace, you can also create an account on newrelic.org and add the license manually. This can be simply done by modifying the manifest.yml . If you have an issue with New Relic and don’t see any data, you can push your application using a custom command. This command is the same we used in the section “Installation and Configuration for Python”, but this time we don’t specify a configuration file and send the output to the console. This way we will see the output in the log for our application. cf push --no-route -c "newrelic-admin validate-config - stdout"